The code compliance and space planning problems of an adaptive reuse can be highlighted in the proposed conversion of a large office building to flats. 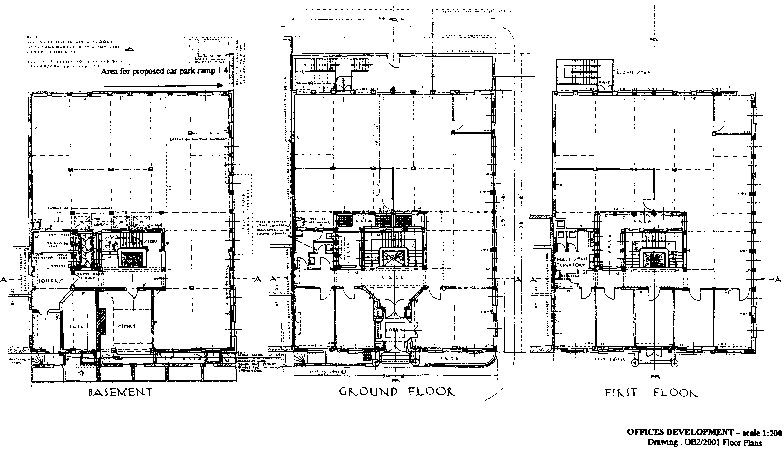 The property, which was built in the late 1930s, is shown in Figure 4.15. Its of Art Deco style and has Grade 2 listed status. 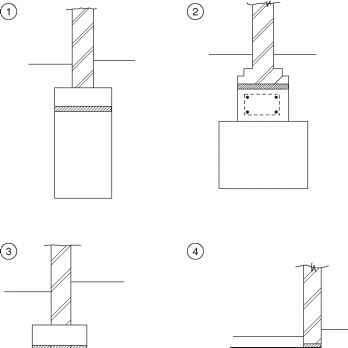 The following building elements therefore require minimum intervention (i.e. the original appearance to remain) and retention of the original interior features of the entrance lobby, hall and stairwell. The fenestration and associated features are to be retained. 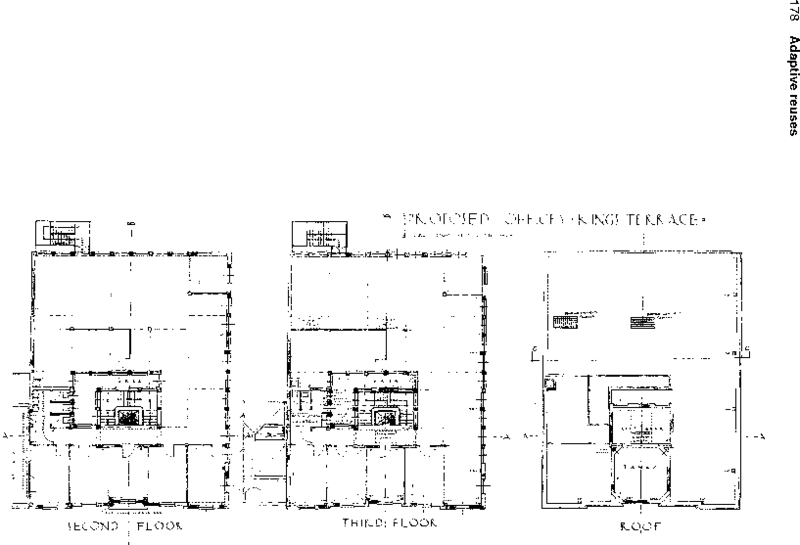 In terms of the building's construction, the steel columns and core as indicated on the plans remain, but associated interior walls, not referred to above, will be removed. • Standards of occupation for the number of people: assume 2-bedroom flats equates 3 bedroom spaces (1 double, 1 single); 1-bedroom flats equates either 2 bed spaces (1 double) or 1 single bedroom. • Developer's return on capital require maximizing the number of flats but minimizing compromises to upmarket space standards and fit-out. The letting agent's view would always be sought in these circumstances. • The basement provides car parking, but the number of spaces (refer to the attached plan) maximizes 9 spaces (no double parking plus disabled parking, provision for waste bins, services intakes and central heating boiler). (i) Building Regulations Part B1 Means of Escape. (ii) Third floor is more than 4.5 m above ground level, so alternative means of escape from each flat would normally be needed. Given that this is a tight site (the building is enclosed at two elevations, the rear and one of the gables), there is no scope to construct an external staircase. 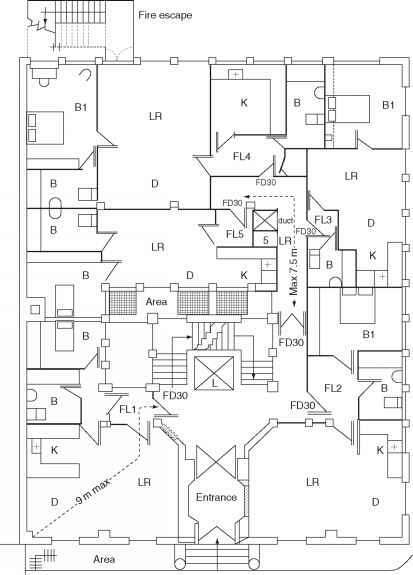 The only alternative would be to install another staircase in the building - at the opposite end to the existing. This would be an expensive and disruptive option that would take up valuable domestic space. (iii) Accommodation is in excess of the standards applied in the Housing Act 1985 (ss. 352, 357), the now defunct Parker Morris Standards (mandatory for public schemes 1967-1981), and the current Housing Corporation floor area bands (1998). See also space standards in Adler (1999). (iv) Travel distances in protected corridors not exceeding 7.5 m.
(v) Travel distances in flats not exceeding 9 m. Where this cannot be achieved within the existing layout, relaxation of the regulations might be considered. However, any granting of relaxation will come with conditions, usually additional fire precaution measures such as alarms or even sprinklers. All flats have alternative means of escape. Normally general arrangement plans are required to 1:100 scale. 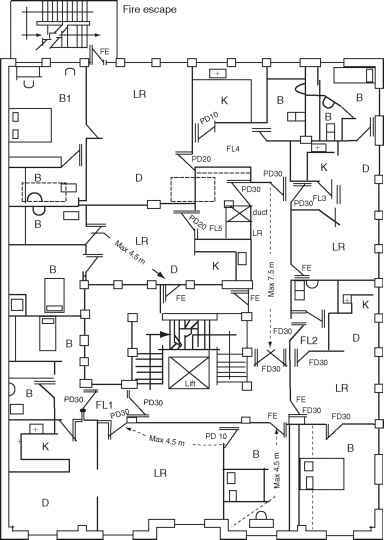 Drawings should be clear, properly labelled and indicated main fixtures (sanitary provision, kitchen surfaces, basic room furniture layouts) including door swings, fire doors and protected corridors. Again, any downtakings should be shown in red.